Movies created by The Asylum are known for being bad. But this is the kind of bad that tries to go all the way to being somehow good, if you get what I mean. And this is not a bad thing - the realm of B-movies is a key part of our shared pop culture history and celebrates what one can come up with on a very limited budget. Interesting enough, SyFy has long recognized this role that B-movies play in our lives and regularly features such movies much to our mixed glee and dismay. And even in these modern times with digital filmmaking and related CGI effects, it's still pretty easy to make cheesily bad movies. A part of me still misses the bad costumes and cardboard sets of the older film era, but then these movies are still pretty campy in their own right. 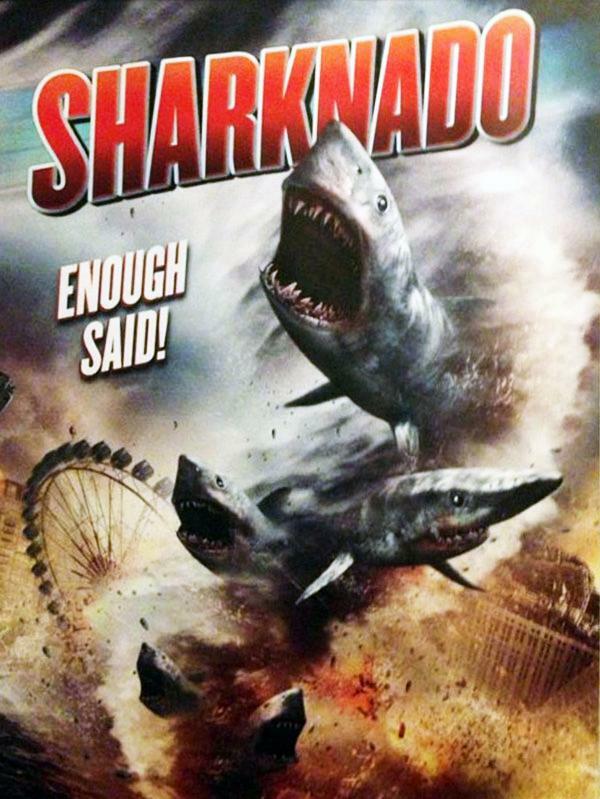 And Sharknado certainly has a most special place given it takes "jumping the shark" to a whole new level of craziness. Synopsis: Sharknado is a 2013 made-for-TV disaster movie that first debuted on the SyFy channel. It was directed by Anthony C. Ferrante based on a screenplay by Thunder Levin. A hurricane hits Los Angeles and the waterspouts created by the hurricane somehow scoop up hordes of man-eating sharks from the ocean and send them flying into the air. Thus the resulting "sharknadoes" end up raining destruction on the city in terms of both regular hurricane damage and random sharks falling out of the sky. It's a ridiculous premise, but just work with me here and suspend your disbelief for a bit. After surviving the initial wave of sharks, surfer and bar-owner Fin (Ian Ziering) realizes the danger that they all face and goes off to rescue his ex-wife and daughter. Accompanying him are his friends Baz (Jaason Simmons) and shotgun-wielding Nova (Cassie Scerbo). Thus they trio must brave hurricane debris and flying sharks as they navigate the horrors of the LA freeway system and get to Fin's family in time. Along the way they end up saving even more people and of course try to stop the sharknadoes entirely with explosives. Where do I begin with this review? I guess one must consider that the movie does not set out to be good - it needs to be campy, cheesy and ultimately "bad". So when bad is the goal, you need to grade on the curve and celebrate the movie for what it is - at least this is generally what I've learned from great film critic Roger Ebert. The movie features a lot of the cheesy tropes that we expect from fan-pandering b-movies like this one. Thus we have a hot girl with a shotgun blasting sharks to kingdom come and our hero Fin dual-wielding both a gun and a chainsaw to defeat the sharks in his way. Forget about logic and forget about the laws of physics - this movie simply does not care. Instead you're in for one campy roller coaster ride with a fair amount of the travel time spent discussing the best routes to take to get across Los Angeles faster. I can't even say that the effects help redeem the movie since we have some of the hilariously worst sharks in the history of movies. They're all crudely animated and move without any regard for real-world physics and they can't even stay in scale! Add in the mixed use of random shark stock footage to fill up the other scenes and you have for some crazy shark attack moments. And this isn't even factoring in the inconsistent depiction of the weather that has the actors dealing with pouring rains and winds and yet just behind them the city is pretty dry. Oh joy. Ziering and the rest of the cast manage to put in some of their best worst acting moments in their movie careers. Words fail me in how campy things get as they try to keep a straight face saying some of the craziest lines in history. But the thing is, it all works and you just need to sit back and laugh your head off as they dodge sharks and struggle to stay alive. But the end of the movie you may feel a little dumber, but any great B-movie should make you feel that way. And it's a silly, good feeling that leaves you smiling for not identifiable reason. But I don't think you should watch this movie more than once - that may result in permanent brain damage. And I say this despite the fact that the movie actually includes subtle references to great shark movies like Jaws with muttered lines like "We're going to need a bigger chopper." Sharknado knows what it wanted to accomplish and does precisely that in the span of 86 minutes of madness. And yes, the movie has been quite the social media sensation that it looks like there's going to be a sequel. But for now, I can only rate this movie as a 2 flying shark attacks out of 5, but that's actually a great score for a B-movie like this.